Tactical Spotting Scopes are ideal in both tactical and hunting environments. The 11-33x50 Tactical spotting scope that includes a mil-cross reticle. Both models are fully multi-coated BK-7 optics provide sharp bright viewing at any magnification in any conditions. 100% waterproof, fogproof and fully rubber armored, both compact scopes are extremely lightweight and easy to transport and use either hand-held or on its included mini tripod. Both scopes features a side focus knob for convenience and changing the eyepiece magnification is smooth and precise using the ribbed rubber focus ring. 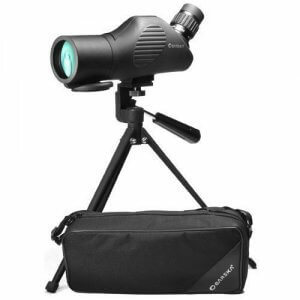 Both tactical scopes include a mini pan head lever tripod, attached objective lens cover and soft carrying case. Limited Lifetime Warranty.